Peralo! One of the friendly 7 nanetti products that the Buono Sano Piemonte consortium produces with maximum respect for the ingredients. 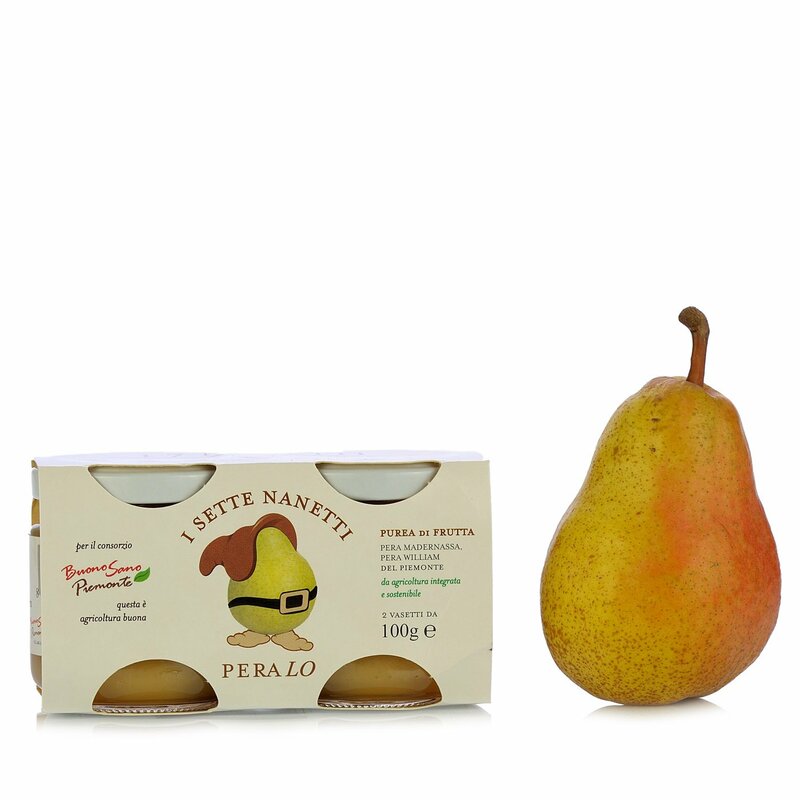 A delicious fruit puree that is made starting with the excellent pears from Piedmont, which are cultivated according to the principals of integrated agriculture. It is an ideal choice for any occasion, and Eataly considers it a perfect choice for a healthy diet, genuine and full of flavour! Ingredients Pear purée 88%, concentrated apple juice, pectin, concentrated lemon juice, ascorbic acid. For more information on product labels, please contact our Customer Service department. The information on the labels of the products may vary for reasons beyond our control, therefore, there may be discrepancies between the information on the site and that on the products delivered. Please always check the information on the product before consumption or use. The 7 Nanetti are made only using excellent and healthy fruit from Piedmont obtained from integrated agriculture using production techniques that are compatible with environmental protection and food safety aspects. The Buono Sano Piemonte consortium reduces the use of pesticides, reduces carbon emissions and controls the entire production process. The result is zero pesticide residuals in the fruit. The 7 nanetti products are a new way to enjoy fresh fruit transformed in an easy to eat puree that is perfect for any occasion. Low in calories (less than 80kcal x 100g), they are an important part of a balanced diet and above all, they are delicious.